Passover is first of seven feasts. It falls in March or April, in the Jewish month of Nisan. On the Eve of Pessach, Chametz ( leaven / yeast ) items were to be searched out and burned. Nowadays Father and the children hunt house with candles. (Mother will have placed bits around to be found). Chametz is a picture of sin and vanity of life in Egypt . AlefBeta have produced an excellent set of on-line teaching videos exploring what lies behind the Exodus story and our celebration of Passover. How do we remember the God who took us out of Egypt? One of the teachings explains the significance of the Firstborn in the Exodus story. The seder begins at sundown and is conducted from the Haggadah (The Telling) The following comes largely from a Messianic Haggadah, which draws out the significance of various items to Yeshua ( Jesus ), which most Jews have not comprehended. 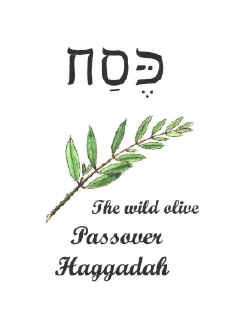 Click here for a Downloadable Haggadah suitable for Christians wishing to celebrate Passover as those who have been grafted into Israel. Is it permissible for Gentiles to celebrate Passover ? The Seder plate is the centrepiece of the table. It has five (or six) dishes around a bowl of salt water. Each dish holds an item of significance which we will come to later. The leader ( Father in a family seder) leads us through the feast, with others taking part. We drink four times during the meal. There is an extra cup which will be mentioned later. First, a woman, mother in a family Seder, covers her head, lights the candles (usually two) and says the blessing. "Baruch ata Adonai, Eloheynu, Melech ha Olam, asher kidshanu b'mitzvah tov vitsavanu l'hadlich ner shel shabbat"
"Blessed art thou o Lord our God, Ruler of the universe, who has set us apart by his word, and in whose name we light these festival lights." "Baruch ata Adonai, Eloheynu, Melech ha Olam, borey pri hagafen"
The leader goes on to answer these questions. (The unleavened bread) - is to remember the Israelites not having time for bread to rise. Blessing for Matzah "Baruch ata Adonai, Eloheynu, Melech ha Olam, hamotzi lechem min ha aretz"' Blessed art thou o Lord our God, Ruler of the universe, who brings forth bread from the earth " All share some. Today, Matzah is pierced and is marked with stripes. See Isaiah 53v5 and Zechariah 12 v10 for prophecies concerning Messiah's suffering. The Authorised Version translation says, "by his stripes we are healed" , meaning the wounds from the scourging Yeshua received before crucifixion. It seems strange that the Jews breaking the Matzah do not see the connection, but scripture says these things have been hidden from them for the present (see Rom 10-11). Pray for the coming day when, like the disciples on the Emmaus road (Luke 24 v30-31) Messiah will be revealed to them in the breaking of bread. Scoop some Marror on to matzah, and eat, allowing the bitter taste to cause us to shed tears. Charoset is a reminder of clay used to make bricks. It is a mixture of fruit, nuts and sweet wine. The first Passover was celebrated by people enslaved. They were instructed to eat in haste, ready to leave. We may recline and enjoy at leisure. When we get to the plagues, we fill our cups a second time. The second cup is "the cup of rejoicing". As each plague is recounted we dip a finger in and allow a drop to fall, reducing the fullness of our cup of joy. This cup is not drunk at this stage. The shankbone of a lamb Represents the lamb whose blood marked the houses of the children of Israel Ex12v3,v5-8&v11-13 Since the Temple in Jerusalem no longer stands, lamb is not eaten at Passover, Hence the bone. The roasted egg is regarded as a symbol of mourning (for destruction of second temple) It is also considered to denote eternal life since the shape has no beginning or end. Some consider it to be a reminder of the burnt offerings in Temple worship. This could be used to explain the idea of a ransom. 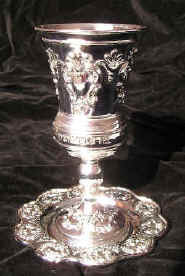 This is the cup of redemption and it is drunk warm to remind us of the blood of the Passover lamb. The extra cup at the table is for Elijah. The children are sent to open the door to welcome him to our Seder. Remember Elijah did not die, but was taken up to heaven. Elijah is expected to come before Messiah. Hallel means "Praise" and is Psalms 113 to 118; or we could use Psalm 136. Where most English translations of Mark 14 v 26 say, "When they had sung a hymn, they went out to the Mount of Olives" they actually sang the Hallel. This suggests to the author, that Jesus' special Seder did not include the fourth cup, but adjourned to Gethsemane where Jesus wrestled in prayer about the cup of suffering he was about to drink. 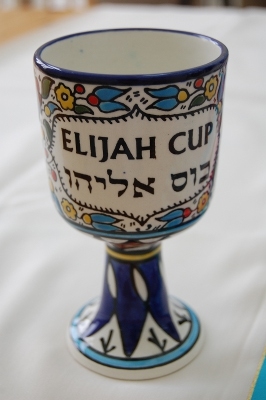 This is the cup of praise. It is drunk while joining in responsive praise for various ways in which GOD has blessed us.
" Lashanah haba'ah bi Yerushalayim" "'Next Year in Jerusalem"
After 70AD (70CE) it was impossible for the Jews to celebrate in Jerusalem and that was their great desire. In 1967 Israel recaptured Jerusalem and since then it has been possible for the Jews to celebrate there, signifying that the "Times of the Gentiles" are drawing to a close. As we watch, prophecies are being fulfilled. We need to Understand the Times in which we are living rather than waiting for next year. But in Hebrew that is, Tam ve’nishlam - These are the first two words of the Hebrew phrase, "Tam ve’nishlam Shevach La’el Boreh Olam", which means, "It is completed and fulfilled, blessed be God, the Creator of the world." The acronym for this phrase, is written at the end of sacred Jewish writings such as books of the Bible. These words were also used in the marketplace, indicating that a deal or transaction had been completed. Thus Jesus declared that he had completed and fulfilled everything God had purposed for salvation, since the creation of the world. On the day after the Shabbat which falls during the time of unleavened bread, Firstfruits is celebrated. It is similar to the firstfruits celebration of Sha vu Ot , except that it is in celebration of the Barley harvest, while Sha vu Ot is for the wheat harvest. How much more appropriate it would be to celebrate Firstfruits rather than Easter. Incidentally, the Pessach was celebrated a month late by the new king, Hezekiah (2 Chronicles 29 and 30. Notice how a spiritual revival is much more important than ritual correctness! Notice too how the people "sang praises until they were filled with joy" (29 v30 CJB), not that they praised because they felt joyful! We may not always feel joyful - feelings are very unreliable. The lectionary reading for Pessach, in addition to the Torah and Haftarah readings is the Song of Songs - Shir hashirim. Rabbinic tradition interprets the book as a love song, where the “beloved” is taken to mean God and “the bride” to mean the congregation of Israel. This tradition made the Song of Songs especially appropriate to Passover, because it marked, as it were, the beginning of the courtship of Israel and God before, metaphorically speaking, they became finally wedded at Mount Sinai by Israel’s acceptance of the Torah. Another reason given for the reading of this book on Pessach is that it is a song of the spring. See also Holy Week for the probable timescale of the events by which Jesus fulfilled prophecy. Those who trusted and applied the blood escaped from the land of their slavery and became a "called out" people, special to GOD. (The nation of Israel) Likewise those who trust in the blood of Jesus escape from their slavery to sin and join God's "called out" people. The Greek for "called out" is the origin of our word Church. "Then he took the cup, gave thanks and offered it to them, saying, "Drink from it, all of you. This is my blood of the covenant, which is poured out for many for the forgiveness of sin"
"Moses then took the blood, sprinkled it on the people and said, "This is the blood of the covenant that the LORD has made with you in accordance with all these words." It has been pointed out that the fields between Jerusalem and Bethlehem ( The Shepherd's Fields ) were used for rearing the lambs for Passover, making it highly probable that the shepherds who visited the infant Jesus were responsible for Passover lambs. We die with Jesus and are born again to newness of life. We leave our old life and set out on a pilgrimage to our final home. We put off the old things (leaven ) of sin and the vanity of the world. We put on the new nature. These three steps together are generally referred to as conversion. Gentiles are welcome at the Passover table. The rituals of the Passover seder and the Feast of Unleavened Bread are designed to inspire curiosity. The children at the table, observing the unusual rites and foods, are supposed to be inspired to ask, “Why is this night different from all other nights?” The purpose of Passover is to transmit faith to the next generation, to the Jew first, but equally also to the Gentile. The Torah clearly states that no uncircumcised person may eat of the Passover. What is more, it says that if a stranger (i.e., a Gentile) wants to celebrate the Passover, he has to be circumcised first. So how can a Gentile keep a Passover seder? Are Gentiles excluded? An uncircumcised Jew and an uncircumcised Gentile are both forbidden from sacrificing or eating a Passover lamb. The Torah does not forbid them from keeping the Feast of Unleavened Bread, though. The law leaves them free to participate in the seder meal and keep the seven days of Unleavened Bread. In the days of the apostles, the Gentile believers were free to remain uncircumcised, but if they wanted to make a Passover sacrifice, they would have been required to first undergo circumcision and conversion. For most Gentile believers, this was a non-issue. They lived far from Jerusalem. Neither they nor the Jewish community around them had access to the Temple or sacrifices. Therefore, they kept the Passover, the seder and the seven days of Unleavened Bread like the rest of Diaspora Judaism—without a lamb. The only thing prohibited for them was the sacrificial lamb itself. This opinion may be derived from rabbinic sources as well. According to the Talmud in b.Pesachim 96a, an uncircumcised non-Jew is allowed to keep the seder and the Feast of Unleavened Bread. Only regarding the actual lamb sacrifice is he banned. This means that uncircumcised believers, whether they are Jewish or Gentile, are welcome at the seder table. They should partake of the matzah, the bitter herbs, the four cups and the seven days of the Feast of Unleavened Bread with a glad heart. We can all share in and rejoice in our common Passover Lamb, Yeshua.